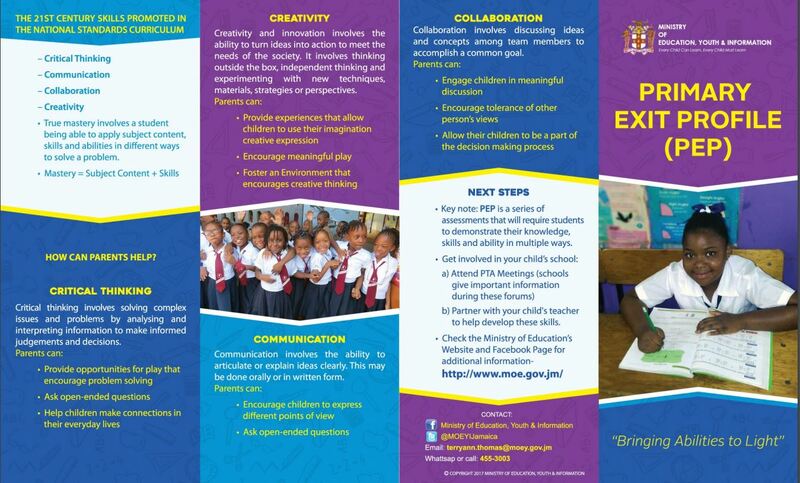 The Primary Exit Profile (PEP) will replace the existing Grade Six Achievement Test (GSAT). PEP will provide a profile of where the student is academically, the student’s strengths and weaknesses, and their readiness for grade 7. 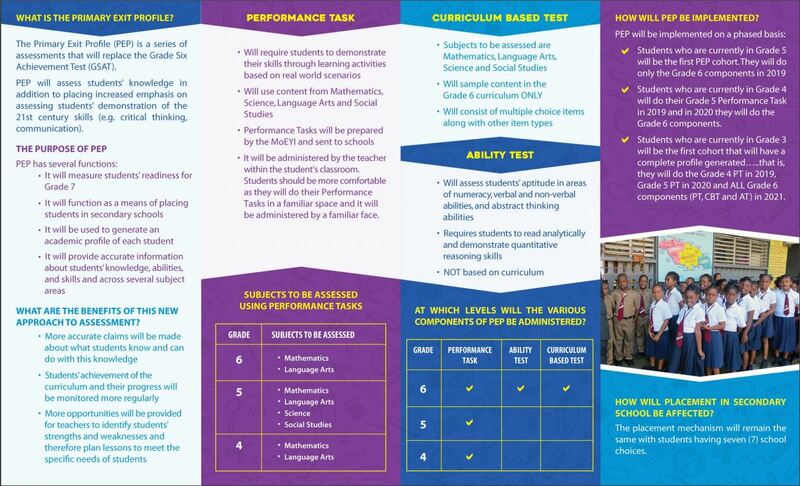 PEP will assess students’ knowledge in addition to placing increased emphasis on assessing students’ skills of communication, critical thinking and creativity. Coming out of the 2004 Task Force on Educational Reform Report, it was recommended that the Jamaican Education System embark on a radical transformation process so as to equip its citizens with the necessary skills and competencies that will give them a competitive advantage in the global market place. Policymakers and educators have identified a number of approaches to reforming Jamaica’s education system seen through the implementation of Education System Transformation Programme (ESTP). Since 2012 the Core Curriculum Unit of the Ministry along with a team of consultants embarked on a revision of the national curriculum for grades one through to nine. The Revised Primary Curriculum (RPC) that had been in use in Jamaican primary schools since September 2001, did not take a developmentally appropriate outcomes based approach in a manner that would define what children should know and be able to do. Additionally, the 2004 Task Force Report recommended a review of several of the assessment tools which the Ministry of Education has since acted on. There was also the review of the Grade Six Achievement Test (GSAT), which started in 2009 and showed several weaknesses, which has taken us to the National Standards Curriculum. PEP is aligned to the NSC.